I was not so angry with my situation that I could not discern beauty.2.5 stars. 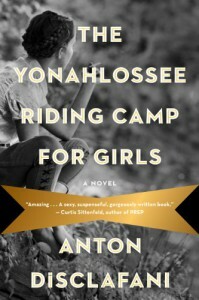 The above phrase from the book describes my exact feelings about Yonahlossee Riding Camp for Girls. I can't remember the last time I've wanted to love a book more than I wanted to love this one. When the tale is about young women coming of age at an equestrian boarding school, sequestered away like only the protected rich in the middle of the great depression could be, you'd think that there would be so much potential for greatness in the telling.Yonahlossee, an island of rich girls in the middle of the poorest.My Nana had fascinating stories about what it was like to live through the depression. I love looking at our family album and seeing all of these glorious, glamorous (even wearing hand-me-downs, everyone seemed SO well-coiffed!) and beautiful snapshots of history. While this book was full of beautiful prose, I would not consider it a beautiful snapshot of history.I was a young woman when young women were powerless.I was expecting a lush and scandalous story, not unlike what the blurbs promised. In fact, I did manage to find both lush and scandalous happenings within the pages of Yonahlossee. The descriptions of even the most trivial things, were beautifully designed and explained. The amount of highlights which I made in my copy of Yonahlossee were many.The pain was part of the pleasure, and both were my memory.Sadly, the beautiful prose was not enough to carry a story which floundered for a great deal of the first half, with no real purpose other than to serve as filler until enough time had passed to recall the main character's scandalous past. I kept stubbornly reading because I knew that a big reveal was coming up around the bend. Heck, every reader knew it. This is what we'd been prepped for from the first page.I was still more child than adult. I was not a monster but a confused, wronged girl. They blamed me. And so I came to Yonahlossee a person worthy of blame.Even with the slow first half, when the secrets started to come out - when everything started coming to a head, I was completely sucked in to the story. Hints of scandal past started to blur as scandal present came in to focus. While I think that some of the happenings were almost too over-the-top, once things started happening which I hadn't been expecting, I was suddenly glued to the pages while I waited to see what would become of Thea. Would she finally find the happiness that she so desperately needed, after being cast aside by her family?They traded you, Thea. They sent you here and kept your brother.So what happened? Well, that is not for me to tell or I'd be giving too much away. All I can say is that (for me) it's not necessarily about needing a good ending or a bad ending, but more about finding a conclusion which resonates with the reader. Unfortunately, I felt like I spent so much time waiting for something to happen and didn't get much to show for it other than a bunch of answers which came with little fanfare and not enough resolution for me to feel like I'd spent my precious reading time wisely.Back then, all that want was a dangerous thing.Who would I recommend Yonahlossee for? If I had to find a niche, I would probably lean toward the literary fiction crowd, those preferring an emphasis on darker or vintage-feeling literature. While I wasn't a big fan of this book, I think there's enough material here to provide for some interesting discussion (a movie would be absolutely gorgeous with this setting). Even though the main character is of a younger age, I am shelving this as adult for themes and content because it wouldn't really appeal to the mainstream YA circle.But if you're going to go vintage for this book, you'll need to have a martini to accompany your reading. After all, it's what my Nana would have done.